Nicole's Needlework: CaHRH Block Three Finished! I got block three finished up last night. I can't believe I only have four more blocks to go! It's amazing Nicole! You're really stitching up a storm on this piece! Block 3 is beautiful - probably one of my favorites. Great job! Stop the presses..it is NOT going in the rubbermaid bin!!!! Seriously, it is gorgeous and it is stunning and I love it! Oh my gosh Nicole - I certainly hope that it won't be going into the Rubbermaid bin. It looks so pretty!!! I can not believe just how much you have gotten done!! 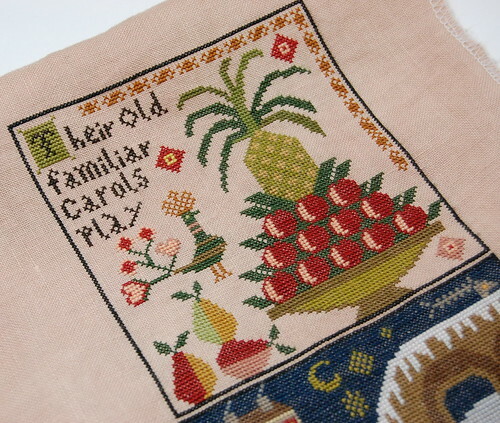 It is going to be gorgeous - I love all the HRH pieces, but watching your progress on this has really made me think that I may have to stitch this at some point. The colors are wonderful!! It looks great! I love that block -the colors just pop! 2/3 of the way done! It will look much better framed than in a tote! I also think that you need to keep this one out year round! 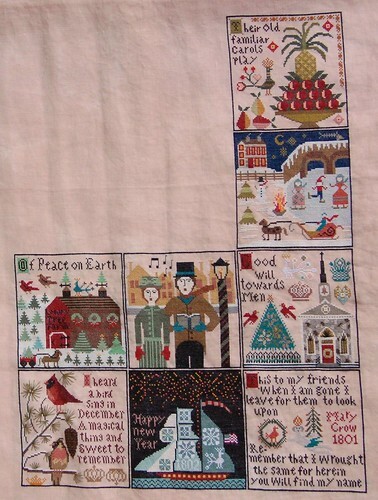 It's absolutely stunning, and I'm in awe of you and so many other stitchers who actually FINISH these large pieces! Way to stitch! Wow, it's looking great! You're whizzing through this one and am enjoying seeing your progress on it! Nicole, you are so inspiring! It is just gorgeous! I can't wait to see your finish -- I know it won't be long now! Glad you managed to get that frame from Shakespeare too! Oh, looks so lovely! Great stitching! I'm very excited for you! It's beautiful! Wonderful progress Nicole, it looks fabulous! I'm thoroughly enjoying being able to watch you stitch this. Thanks so much for sharing. It's just beautiful. Wonderful block. Your in the home stretch now. It will be so beautiful when it's all done and framed. Woohoo!!!! That's awesome. And I'm so glad you went ahead and ordered the frame, you'll be so happy to see this hanging! Qooo, Nicole, you're an inspiration (as usual). I got this pattern at TNNA and my friend and I have been considering a SAL. Here's hoping mine looks half as good as yours! Nicole! You are seriously rocking this piece! YGG! So pretty Nicole! You'll be done before you know it! Wow, you are going so fast on this. It looks so amazing. Goodness Nicole...your so quick! Love it. Beautiful, can't wait to see it framed. I am just amazed at how quickly you are getting this done! You are a most inspiring stitcher! Great going, and it's really gorgeous! NO bin for this beauty Nicole! It is simply stunning. 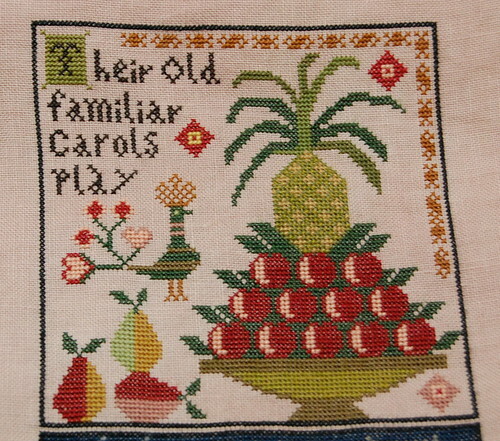 I've been wanting to stitch Ann Grimshaw for years - can't wait to see your needle go and go on this one. That one's a beauty! I know I always say this, but you're such a speedy gal. It's beautiful, Nicole! I can't believe you are so close to finishing this one, and I'm thrilled to hear that you will be framing it, and not relegating it to the rubbermaid box!